We’re closing out our 2010 schedule with a bang – our first gig at The Bitter End! Join us for a great night of music at one of NYC’s legendary venues, with opening sets by The Defending Champions and more. We’re taking a couple of months off after this show so catch us while you can! THE BEAST IS BACK! 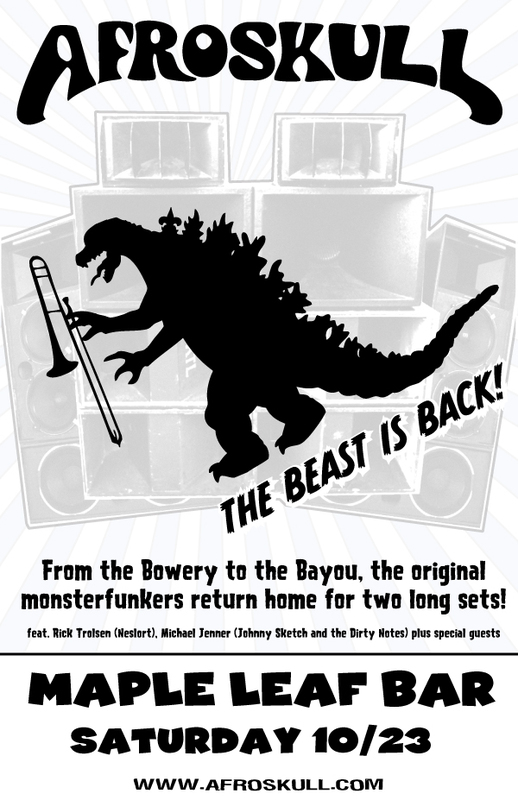 The original monsterfunkers return home for the first New Orleans Afroskull appearance since 2007! Join us at the legendary Maple Leaf Bar on October 23rd for an awesome merging of the classic New York AND New Orleans Afroskull lineups. We are super psyched to welcome back Matt Barone on keyboards for the first time in seven years! 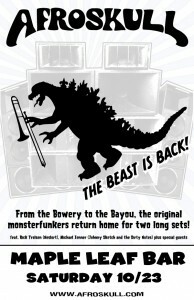 Along with Funky Dollar Bill on bass, and one of our fiercest horn sections ever, this show will be huge!!! with special guest The Madd Wikkid and more! November marks one year since the release of To Obscurity and Beyond. It’s been a great year filled with plenty of shows, awesome reviews, radio airplay and, best of all, new fans. Thanks to everyone who has been a part of it! We’ll be closing out the year with our last show of 2010, appropriately enough at the Bitter End in NYC. Join us at 11:30pm on Friday, November 5th. The latest review of To Obscurity and Beyond is a keeper. Check it out at the ProgArchives. We got a great recording of a recent show at the Bowery Poetry Club. Stream it or download for free at the Live Music Archive. Eyewitnesses are reporting that two of our songs were used in another episode of Man V. Food on the Travel Channel. Listen carefully to hear the ‘Skull in MvF’s recently-aired Knoxville episode (among many others). Don’t waste your vote this election season. Vote for Afroskull in the Jambands.com 250! Another last minute addition to the schedule – a free Saturday night show at one of our favorite haunts, the Bowery Poetry Club. Join us for two sets of our finest funk starting at 8pm. Doors open at 7pm with DJ Cochon de Lait spinning before, after and in between sets. And if for some crazy reason you can’t join us in person, you can watch the show online at bowerypoetrylive.com. Please join Afroskull for our first ever show at the Mercury Lounge. We’ll be in there for an early set (music starts at 8pm sharp) on Saturday, June 12th, so grab some dinner and then come rock out with Afroskull on Houston Street! And stick around for our good friends OTiS at 9pm. We’ll be rocking a late night set at Some Kind of Jam 5. Join us for our first festival performance since 2003! We’re playing Saturday night, April 24th at midnight. Featuring: Todd Stoops (RAQ), Rodney Holmes (Steve Kimock Band), Mark Diomede (Juggling Suns), and Mark Sterling (Jazzam). SOME KIND OF JAM 5 will be a full weekend music & camping festival featuring 22 bands, 3 stages, late-night indoor jams, numerous solo-artists, kids activities, light shows, fire performances, food & craft vendors and more. Join us for a weekend of camping and music in a hassle-free, BYOB environment. Our new venue is a beautiful 60 acre property outside Schuylkill Haven, PA. The site features plenty of room for camping, permanent restrooms & showers, indoor & outdoor stages, nature trails, PA approved trout fishing waters, and electricity access for RV’s. As always, a wide array of musical styles will be featured including: Jam, Funk, Folk, Bluegrass, Blues, Rock & Roll, Reggae, Americana and more. Presale tickets will be just $40 and include a full weekend of camping & music. Patrons may camp with their vehicles and each stage is in close proximity to the camping area. STRANGERS HELPING STRANGERS will be conducting a non-perishable food drive, so please help contribute to those in need. As always, GROOVIN LUMENS will be providing psychedelic lighting for the masses. The CD is done! Celebrate with us on November 7th! UPDATE: We’re still updating our new web store. 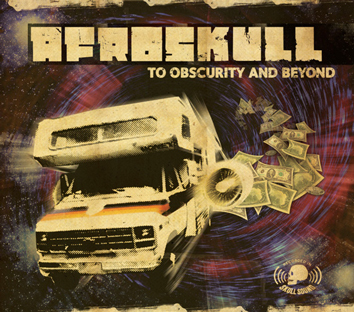 Stop back here tomorrow (Sunday November 8th) to order the new album directly from Afroskull.com. Friends and fans of Afroskull – if you have followed the band over the past few years you are no doubt familiar with the saga of the mythical new CD. Well we are proud to announce that the disc is finally finished! To Obscurity and Beyond, our first CD of new music in nine years, will be released on November 7th! The new album features nine mind-blowing Afroskull originals. Jazz legend Ronnie Cuber joins an expanded horn section to breathe fire into Joe Scatassa’s high-wire horn arrangements while the rest of the band pours on the gasoline. To Obscurity and Beyond is the culmination of four years worth of writing and recording specifically designed to melt your face! Join us for the CD release party on Saturday, November 7th, at Ace of Clubs in New York City. Come down early for great sets from our friends Wounded Buffalo Theory (8:30pm) and Blue Food (9:30pm) before Afroskull blows the roof off. We’ll be doing two epic sets, including the new CD in its entirety, with a special five-piece horn section and special guests. THIS is the Afroskull show you have been waiting for. Greetings once again Afroskull fans. We’ve got two big shows coming up this month. First up, this Saturday night (9/12) we’re live at Union Hall in Brooklyn. It’s our first show in Brooklyn in a long time and our first gig ever at Union Hall, one of the borough’s best venues. We’re the first band on a great bill that also includes Buffalo Killers, the Scott Metzger Band and the Nate Wilson Group. Plus we’ll be joined by a special guest on bass: our old pal from New Orleans, Matty Williams! The funk starts at 8pm. Next up on Friday 9/18 is a special benefit show for the Parkside Lounge, our home-base for the past few years. The club has fallen on hard times and needs our help! We’ll be joined by a couple of special guests: The Wild Koba on keyboards and guitar, and Bearded Jon Stonbely on the bass! Come out on September 18th to support the Parkside Lounge and your favorite purveyors of monster funk, AFROSKULL. Show time once again is 8pm. We’re back from our little siesta and ready to get down. 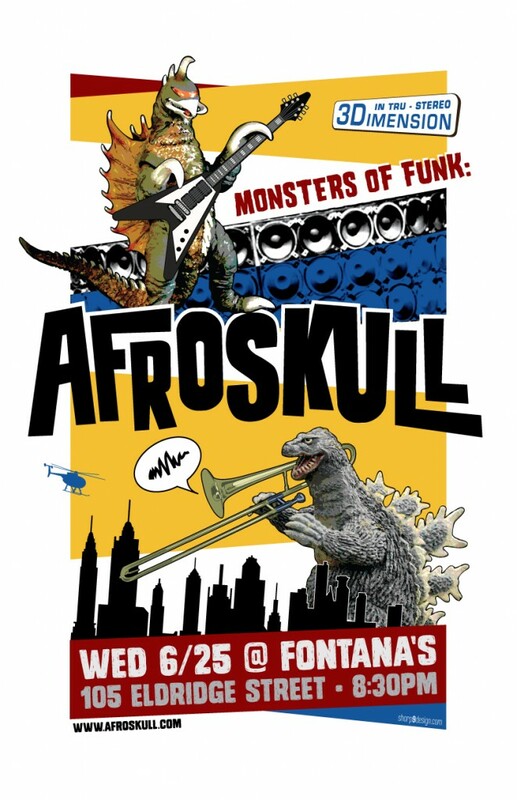 Join Afroskull at the Parkside Lounge in New York City on July 24th for a full set of the super-heavy funk. We’ll have Bearded Jon on bass, Superman Seth on percussion and the full horn section along for the ride.